We’d love your help. 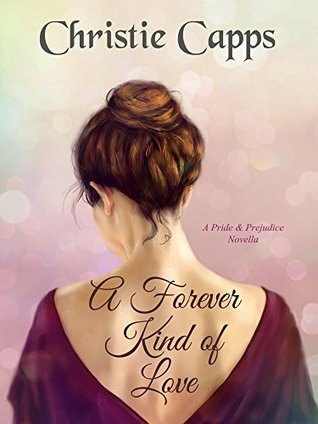 Let us know what’s wrong with this preview of A Forever Kind of Love by Christie Capps. To ask other readers questions about A Forever Kind of Love, please sign up. A Forever Kind of Love is a circle-of-life kind of Pride and Prejudice. It's written from the perspective of Mr. Darcy when he and Elizabeth have been married for 25 years. Of course, he's still madly in love with his wife, but he's feeling his age and frustrated with all his aches and pains. He reminisces about a childhood incident involving his two eldest children, Rebekah, whose personality is similar to Elizabeth, and Alex, a duplicate of his father in both looks and personality. Rebekah is A Forever Kind of Love is a circle-of-life kind of Pride and Prejudice. It's written from the perspective of Mr. Darcy when he and Elizabeth have been married for 25 years. Of course, he's still madly in love with his wife, but he's feeling his age and frustrated with all his aches and pains. He reminisces about a childhood incident involving his two eldest children, Rebekah, whose personality is similar to Elizabeth, and Alex, a duplicate of his father in both looks and personality. Rebekah is married now and lives at a neighboring estate. The youngest Darcys are twin boys, James and Gerald, who are 12 years old. Most of the story centers around Alex, who apparently is feeling the need for a wife. Darcy determines to help choose the proper spouse for his son, but Elizabeth is way ahead of him, to his great delight and amusement. He observes Alex and his cousin Harrison Bingley as they interact with several eligible young ladies during a house party at Pemberley. One in particular, Miss Penelope Greenwood, discomforts both Darcy and his son until the father recognizes the echoes of a similar beginning to a relationship. This is such a sweet, poignant story. All the characters feel decidedly real. The loving relationship Darcy and Elizabeth have is something everyone hopes for when they marry, filled with concerns about their offspring, shared remembrances and tenderness, and teasing back and forth. It's an impossible ideal in real life, of course, but we certainly expect it for the Darcys. Here’s a surprise – we’re all getting older. The Darcys are soon to be grandparents. Elizabeth takes things in her stride but Darcy notices he has grey hairs and that he chooses smaller, easier-to-ride horses. Middle-age doesn’t sit well with him. But what’s this – his oldest son has noticed a possible bride? Is she the right girl for Alex? Ah … here’s a project worthy of an experienced charmer like Darcy. I loved seeing the son’s resemblance to his Father. I loved how much the Darcy’s chosen bride resembles Elizabeth. But Alex’s choice – could she be Caroline Bingley? This is a very pretty vignette about the passage of time. A book full of tenderness and love. My only regret is that it is too short for the story to get depth. This is a short and very sweet sequel to P&P dealing with Darcy's thoughts as he not only ages but as his off spring are reaching adulthood and he thinks he must monitor and/or influence their choices for marriage. And we read his thoughts on his long marriage to dearest, loveliest Elizabeth. It is ironic that the oldest son is so much like his father. ODC invite a number of young ladies and their parents to visit at Pemberley. The twins very quickly decide just who it is among the young ladi This is a short and very sweet sequel to P&P dealing with Darcy's thoughts as he not only ages but as his off spring are reaching adulthood and he thinks he must monitor and/or influence their choices for marriage. And we read his thoughts on his long marriage to dearest, loveliest Elizabeth. It is ironic that the oldest son is so much like his father. ODC invite a number of young ladies and their parents to visit at Pemberley. The twins very quickly decide just who it is among the young ladies that they would court while their brother is playing the silent lean-against-the-mantle type. His Bingley cousin, Harrison, is there and does his best to help things along. Technically this is a P&P sequel, set when Mr & Mrs. Darcy's daughter is about to have a child of her own. Our dear Darcy decides that it is time for his eldest son to marry because as we all know "that a single man in possession of a good fortune must be in want of a wife." And Daddy er. Mr. Darcy agrees. He is worried that his son won't choose wisely so has a house party at Pemberley to invite some perspective young ladies. Mrs. Darcy is as surprised at this turn of events as you will Technically this is a P&P sequel, set when Mr & Mrs. Darcy's daughter is about to have a child of her own. Our dear Darcy decides that it is time for his eldest son to marry because as we all know "that a single man in possession of a good fortune must be in want of a wife." And Daddy er. Mr. Darcy agrees. He is worried that his son won't choose wisely so has a house party at Pemberley to invite some perspective young ladies. Mrs. Darcy is as surprised at this turn of events as you will be dear reader... but she acquiesces as only a loving wife of 20 + years could. This is a middle aged, 53, Darcy who thinks he's a youth but is cursed with an aging body. His sons are charming, his daughter delightful. Don't look for any other P&P characters only Bingley's son Harry pops in. I kept hoping to find out what happened to Caro but the author denied me that guilty pleasure. I really adored this book watching Darcy want to meddle to get the daughter-in-law he wants and Lizzy constantly putting the kibosh on his enthusiasm. One Christie Capps book is never enough! The title says it all in this sweet loving novella. Darcy and Elizabeth have been married for 25 years, they are expecting their first grandchild from their daughter. Their son, Alex, is trying to wade through the debutantes and thinks he has found 'the one'. Darcy, in the meantime, is starting to feel his age. He also thinks he can help his son fin One Christie Capps book is never enough! This is a lovely quick read. The characters of Elizabeth and Darcy later in their married life is just what I would imagine them to be. To see Darcy as a matchmaker is sweetly funny as he only wants the best for his son. This book is a keeper. I can see reading this one whenever I am feeling a bit low to get a lovely lift and a smile. A wonderful glimpse into the future of Darcy & Elizabeth and their offsprings. The kind of love that is shown through understanding one another even through up and downs in their lives. Marriage is not perfect, but finding someone who perfectly understands you. It’s the “Forever Kind of Love”. I love the Darcy twins in this as well. I think this is my favorite in the Christie Capps bundles. Always with humor does this author write ~~ no matter what name she chooses! I love it when an author takes the next generation of Darcys and Bingleys and makes the story absolutely delightful!!! For those of us that sometimes need a short but satisfying read, this is one of the best. This was the last book in the boxed set I had yet to read by this author. Going in I was nervous because the story isn't the traditional D&E story. No, this one takes place several years down the road after their children are grown and looking for their better half. Their daughter Becca is expecting her first child and has been married for some time. Darcy relives key memories of not only his marriage but special moments of his children. His daughter at 4 adjusting to losing her brother Alex This was the last book in the boxed set I had yet to read by this author. Going in I was nervous because the story isn't the traditional D&E story. No, this one takes place several years down the road after their children are grown and looking for their better half. Their daughter Becca is expecting her first child and has been married for some time. Darcy relives key memories of not only his marriage but special moments of his children. His daughter at 4 adjusting to losing her brother Alex was so cute. I loved the personality of a little girl addressing her father about wanting to go to school herself. It will stay with me for a while as I adore reading about their life together as husband and wife. What I cringed at was an older Darcy. He was still dashing and his family was his biggest pride but it was him feeling old with the aches and pains. He was being corrected by his daughter for riding his horse to fast at his age. It was cute but a reality I do not want to know. I really enjoyed this little glimpse into Darcy and Lizzy's life 25 years later. It's a satisfying story with characters that felt real an In this Pride and Prejudice variation, Lizzy and Darcy guide their son Alex in his search for his perfect match. It's not an easy task, Alex has as little love for the pretenses of society as his father did, and tends to make the same prideful missteps. Luckily all he needs to do is look to his parents for an example of a deep and abiding forever kind of love. Heart-warming tale of the Darcy's as they are in their middle age. Darcy is having somewhat of a mid life crisis and what better way to attack this conundrum than to meddle with his offspring affairs... Darcy as a matchmaking father was both funny and adorable at the same time. The continuance of the love between ODC was especially lovely to read but their offspring was a joy as well. This book answers the question of what kind of parents Darcy and Elizabeth will be. In the story, they are engaged with finding a wife for their eldest son without letting him know. It’s funny and sweet and I really enjoyed reading it.